The Custom Report allows users of all levels to create a report of two or more data sets across the same or multiple years for side-by-side comparison. Depending on the District Student Information System (SIS), the Custom Report may also include student demographic information, test dates, and other details. In the Top Menu Bar, click the grid icon (or current module name) to open the navigation grid menu and select Reports. The default setting shows the list of Predefined Reports first, then the rest of the reports in alphabetical order. Or, from the Launchpad, click on the REPORTS flip card. On the flipped side, select Custom Reports. Then click on the Name of an existing report (if available), Create New Custom Report, or select More to go to the Report Manager. Click on Create New Custom Report on the REPORTS Flip Card or from the Custom tab in the Report Manager. 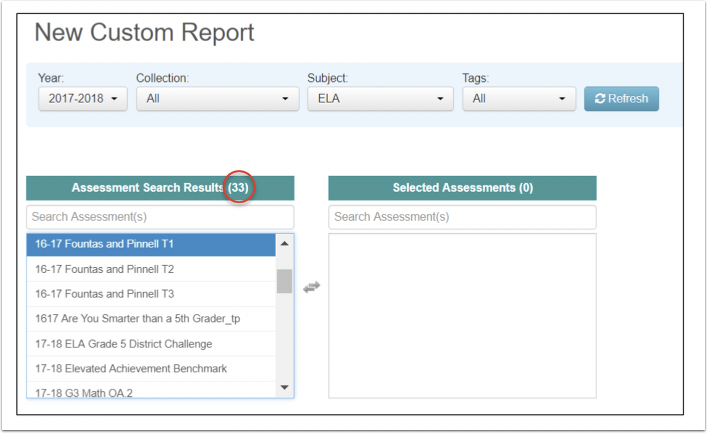 Select Assessments: Use the search drop down menus for year, collection, subject, and/or tags to find the assessments you wish to include in the new Custom Report. You may select more than one Year, and more than one Subject. Click Refresh. Assessment Search Results: Assessments matching the search criteria will appear in the left hand column with the number of matching assessments in parentheses. If desired, use the open search box to find a specific assessment(s) from the results list. Selected Assessments: Select the assessment(s) you wish to include in the report by clicking on the assessment name. The assessment will move into the right hand column. Remove the assessment by clicking on the assessment name to move it back to the search results list. Select Score Type: A table will appear below with the chosen assessments, subject, and options for the type of scores to include. Score types depend on the assessment. Reorder Assessments: The order of assessments can be changed by clicking on the horizontal lines next to the assessment name and dragging it up or down into the desired position. The report will display the assessment results vertic, from left to right, in the order they are listed here. Show Advanced Selections (optional): More information may be included in the report by clicking on the blue Show Advanced Selections tab on the bottom right. Advanced Selections (optional): Make your selections from Roster Year and Roster, Display Column (add these options to the report), Test Date (slide No to Yes), and Demographics (click on the options you want to include depends on district SIS). Hide Advanced Selections by clicking on the orange tab. Save / Save & Run Report: Once you have made all your selections for the new Custom Report, you can Save the report, which allows you to close the report and return at a later time. Or, you can Save & Run Report. You will be able to make edits as desired after running the report. Both options require you to name the report. Click Save or Cancel, then OK in the confirmation message. Search filters depend on user role. Click Refresh to view results. Filter Students (See Step 4). Student View (default as shown) and Summary View (See Step 7). Create Group: Create a student group for specific purposes. See the Help document, Groups: Creating and Managing Student Groups, for more information. Performance Level/ Proficient/ Not Proficient: Check the box(es) to view results by the desired measure(s). (See Step 8). Order Assessments: Reorder assessments as needed (See Advanced Filtering, Step 5). 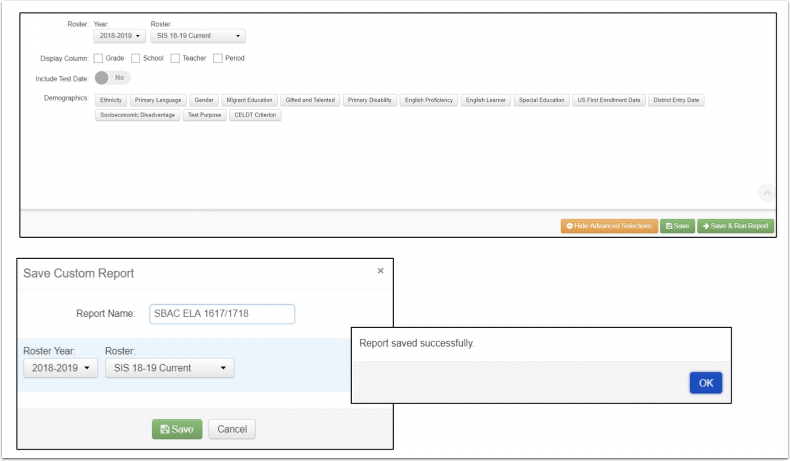 Edit Report: Return to the setup page to reselect assessments and/or revise Advanced Selections. Full Screen: Click to expand the report to full screen. Download icon: Export the report to PDF, Excel, or CSV format. Show All Students (show results for all students on all assessments) or Matched Students (show results only for students who took all assessments). Results: Test results display according to the parameters selected in report setup, including any demographics from Advanced Selections. Return to Custom Reports list in Report Manager. To further filter the data, click on Filter Students. Use the drop down search boxes in Class Detail and Demographic Selections as filters. Select More to see more options, which will vary depending on information the district collects. Click on Apply to view the results. Click on Filter Students again to close the search field. Order Assessments: Click on the green circle with a plus sign to show the assessments. Click on the lines to the left of an assessment name and drag up or down to reorder it, and then click Apply. Performance Level: Each performance level can be used as a filter. Click on the color(s) to remove the check and hide the results for the level(s) below. Assessments may include up to three Performance Level sets as determined in the assessment creation process. All Performance Level Sets: All PL sets may be selected to display. Performance Level Set 1, 2, or 3: Use the drop down menu to select a specific set. Click on the refresh icon to display only the results for that set. By School: View District and School level scores. Performance Levels/ Proficient/ Not Proficient: Check the box(es) to view results by the desired measure(s). District Results: (blue type) District total number tested, average percent correct, and performance level sets results for each assessment display in the top row. School Results: (black type) School total number tested and average percent correct, and performance level sets results for each assessment display in the second row. Click on Edit Report to return to the set up page to reselect assessments and/or revise Advanced Settings. Export to PDF, Excel, or CSV. Summary By Grade: View results by grade. Summary By Teacher: View results by teacher. 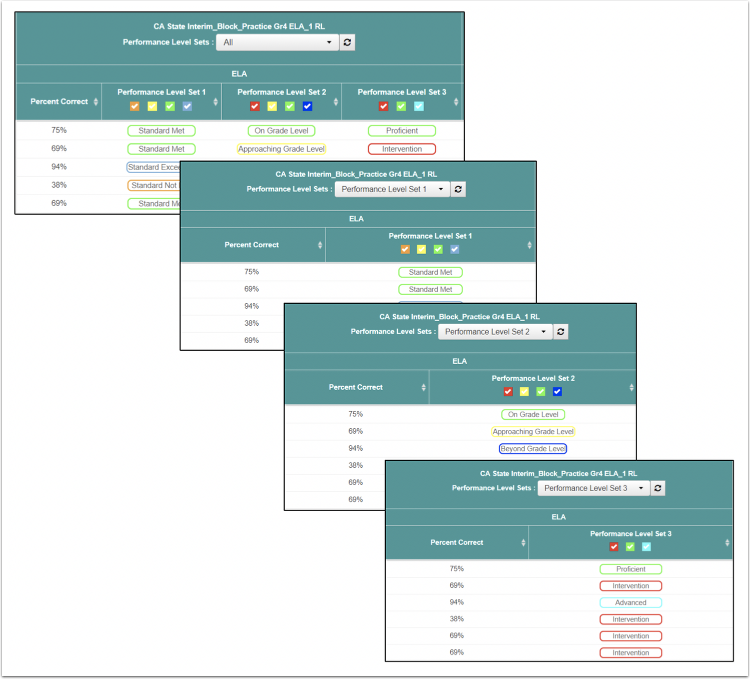 View Performance Levels: By default, the results will display by Performance Levels if they were set during the assessment creation process. View Proficient / Not Proficient: (based on Performance Level cut points) Check the box to add Proficient and/or Not Proficient. If all selected, another column, Performance, will be added to the assessment results. If only Proficient and/or Not Proficient is selected, then only those results will be displayed. Once saved, the new Custom Report will be listed in the Report Manager under the Custom tab. 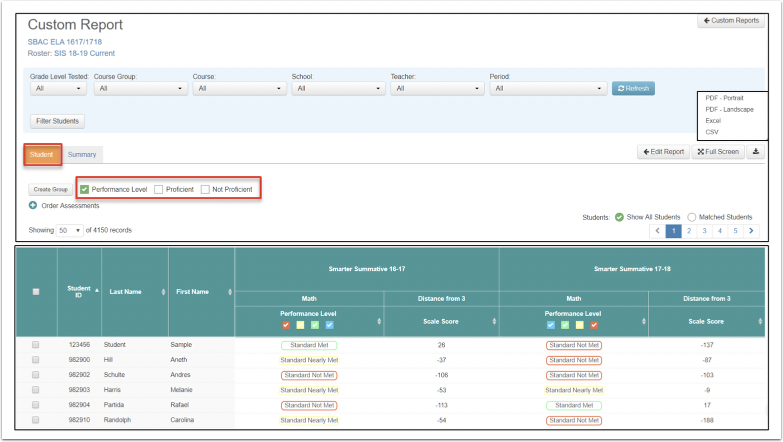 Teacher users can create reports that include assessment results for students on their roster(s). All teacher-created reports are private. Teachers may view (eye icon), edit (pencil icon), copy (double pages icon), share with permission (arrow icon), delete the report, rename it, and see its history. 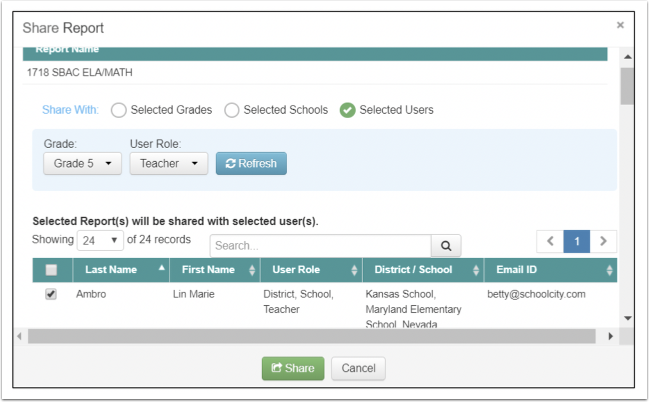 Teacher users may share their custom reports as determined by the District sharing permissions. In the same row as the Report Name, click on the Share icon in the Functions column. Select the users you wish to share with and click Share. The report will be displayed in the users’ Custom Report tab in the Reports Manager. District and School users have three View options. Set the View to Private (only the creator can view it), Semi-Private (only users selected by the creator can view it), or Public (all users in the district or school can view it if they have permission to view the students’ data). 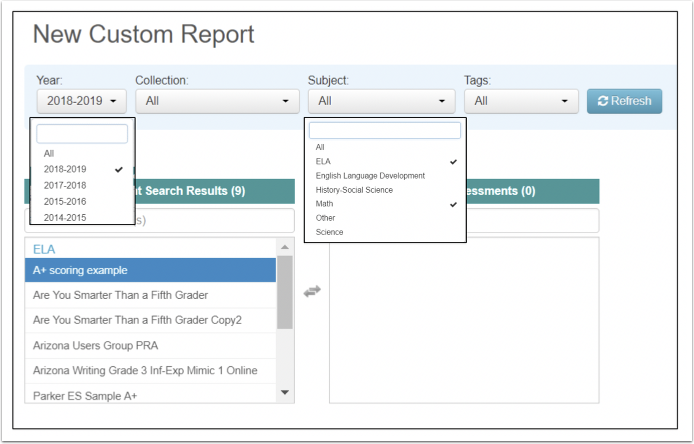 If a Custom Report has been shared with you by a District or School Level user, it will appear in your Report Manager, Custom tab, without an open box on the far left. You can only view and copy it. You may not edit or share the report. Results will be only for those students you have permission to view.